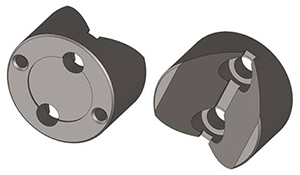 These toriod spheres are designed to match our standard line of press-in or surface mount kinematic vee slots, The shape of this component is made in the form of a double segment of a classic toriod. The smaller radius is the same as the standard spherical radius that matches our standard line of cones, flats and vees. However the primaruy radius is several inches in dimension. This design gives a much larger contact area under load than a traditional sphere. These products may be pressed-in or surface mounted. The beauty of this design is its ease in manufacture and thus its relatively low cost. These toriod designs are available in 304 S.S., A2 hardened tool steel, or hardened 17-4PH stainless steel. This new product will be available in March so stay tuned! Hitek Hardware, inc. introduces a product line of very fine pitch lock nuts. 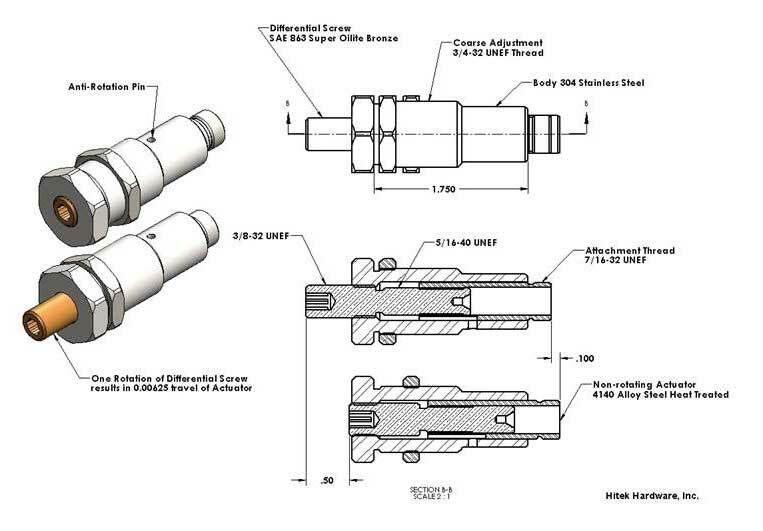 Hitek Hardware introduces its new DSA-12 differential screw assembly. This device is a complete differential assembly ready to be mounted into a design without any further design or manufacturing effort. We believe this is the only fine adjust actuator on the market that will handle loads in excess of 200 pounds. It has both coarse adjustment and fine adjustment features that allow straight forward positioning in the project. Hitek Hardware introduces a new line of kinematic components manufactured of A-2 Tool Steel hardened to 58-62 HRC. These are offered in various sizes to meet your design needs. Shown is a typical component.